People at our shop often ask me if their fish are “happy”. This may seem like quite a strange question to some, but it is great to hear that people actually care about the wellbeing of their fish. 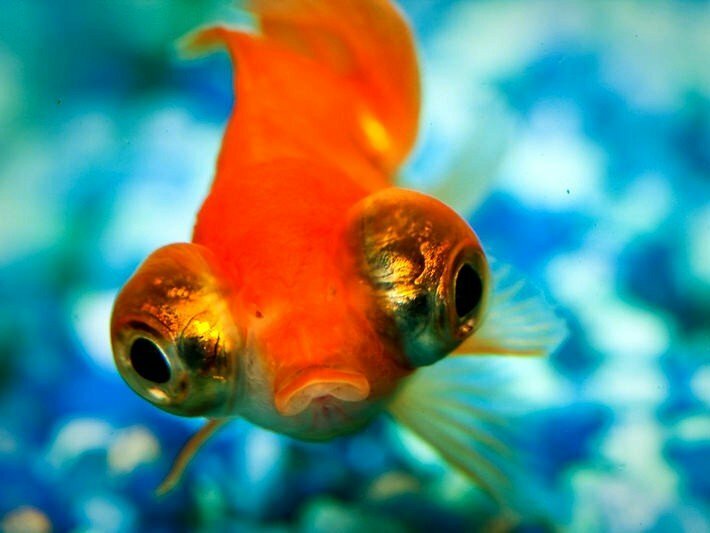 Do fish feel emotions? It is difficult to tell. What all fish keepers know however is that all fish have personality. And they remember things. I had a customer come into our shop that had a goldfish she had kept in a tank in her kitchen for around 8 years. She called me up, quite upset, because she had to move back to Germany to be with her family for a couple of years, and needed to find a good home for her pet. We agreed to take her fish and put him in one of our ponds. She brought him over to our shop one morning, and we put her goldfish into a tank with a bunch of other goldfish until we could move him into our pond at home later that week. A few days later she came back to the shop to see her pet one last time before she left for Germany. She walked up to the tank and immediately her fish came up to the front of the tank and just stayed there looking at her and swimming at the glass. Her goldfish seemed vibrant and happy! All of the other fish were behaving normally, just swimming around the tank as usual. Tears welled up in the lady’s eyes, and they spent around half an hour gazing at each other before she had to go. I was amazed by seeing this, and after she had left I went up to the tank but the fish was not interested in me at all. It was clear to me that her fish remembered her, and was actually happy to see her. I know I could have this wrong, but I think that most fish keepers experience something similar when they walk past their pond each morning and see their fish coming up to the surface in their pond.So whether you think fish experience happiness or not, it is still our responsibility to ensure that they have the best quality of life possible, that their requirements are fulfilled in order for them to be healthy, and lead a natural (happy!) life. What I mean by this, is that fish need space to swim around, interest in their environment, such as water plants, a mixture of species, a waterfall perhaps or air bubbles.They need their water quality kept good, with a proper filter adequate for the pond size and fish type. And they must not be overcrowded.Koi should be kept in ponds of at least 1000 litres, and goldfish require at least 100 litres in our opinion to be happy. I can’t stand seeing poor Siamese fighting fish living in a jar on their own! Just keeping a fish alive is not enough. Take joy in providing a nice environment for you and your fish to enjoy.